This Wordsworth Classics edition of Anton Chekhov’s short stories collects twenty-three stories and one novella, all of which were written between 1883 and 1900. I’ve been aware of Chekhov’s reputation as one of the greatest writers of short stories of all times for a long time, but I’d never read him until now. The Classics Circuit White Nights on the Neva tour was the perfect opportunity for me to find out why these stories are so renowned. Apologies again for the fact that my post wasn’t up the day of my actual tour stop, which was last Sunday. In case you’re wondering whether Anton Chekhov’s writing lived up to my expectations, let me start by saying that yes, in many ways it did. It also did a lot to dispel my intimidation when it comes to classic Russian authors, which is exactly what I was hoping would happen. What stuck me the most about these stories was that the man who wrote them must have been extraordinarily kind. He writes about his characters with the same tenderness I love about E.M. Forster, and he does so regardless of whether they’re foolish or wise, or of which walk of life they come from. He’s sensitive, perceptive, insightful, and always immensely humane. It’s a little strange to think of Chekhov as a contemporary of the Victorians, as his style is quite a bit different from what I’ve come to expect from the literature of this period. Of course, Victorian literature is no monolith, and I think that its moralistic tendencies are very often overemphasised. Still, Chekhov’s stories surprised me – they read more like Modernist pieces than like late nineteenth-century ones. It’s no wonder that so many of the Modernists cited him as an influence. That the role of fiction is not to proselytise seems obvious enough to go without saying (though over a century later, people often still seem somewhat unclear on this point, and inclined to rant and rave about a book’s “message” or lack thereof). Yet at the same time, literature can teach us empathy and compassion; it forces us into the shoes or others and makes us acknowledge the common humanity that binds us to even those whose lives and ideals are completely different from our own. Most lovers of literature won’t deny that it can achieve much when it comes to ethics, but the more subtle and the less heavy-handed an author is, the better this seems to work. The short story “At Home” is, interestingly enough, a fictional examination of all these questions surrounding the role and goals of storytelling. A father struggles to teach his young son not to steal his cigars and smoke them. After several fruitless theoretical explanations about respecting other people’s property, he manages to get his point across by telling him a story about what happened to another boy who stole and smoked cigars. His success, however, troubles him – is using stories in this manner a form of manipulation or deceit? Is it a betrayal of what they’re meant to be? What makes “At Home” such a great story is its subtle humour, which gives readers the clear impression that as seriously as Chekhov took these questions, he was not unwilling to laugh at himself and at the controversies he was dragged into. A few words on some other stories that stood out for me: “In the Ravine”, the novella, portrays a world as bleak and harsh as that of Ethan Frome, and the effect is equally moving; “The Night Before Easter”, my favourite story in the collection, is a delicate, perceptive, atmospheric and almost magical evocation of grief and loss; the brief “Little Jack” is a moving story about a young boy apprenticed to a shoemaker who writes to his grandfather on Christmas Eve asking him to come rescue him, and it’s only at the end that readers realise just how hopeless his situation actually is. As much as I enjoyed these Selected Stories, however, I suspect that I’d have gotten even more out of them if I knew more about Russian history. I know the basics, and I know that some parallels can be made with the rest of Europe in the nineteenth-century, but I often wished I was better able to contextualise these stories. “The Death of an Official” and “Lean and Fat”, for example, are straightforward enough in their satire of rigid class distinctions, and yet I wondered if there was more to them than what seemed at first glance. It’s easy to see what Chekhov is trying to get across in general, human terms, but how does this fit into the big picture? All of this makes me want to brush up on my history before my next experience with the Russians. But that aside, my experience with Selected Stories was a great success. Chekhov’s use of humour and the modernity of his style surprised me. And his insight and sensitivity lived up to all the good things I had heard about him. Two things: first of all, I’m back! The laptop is back in business and I was able to copy all my files before reformatting it and reinstalling Windows, which did the trick. Hopefully life will resume normally now, and I’ll finally manage to Catch Up With Stuff. If I owe you an e-mail or haven’t visited your blog in weeks, please know it’s no lack of love. And secondly, the lovely Rebecca at Lost in Book featured me on her twenty questions series today. Please drop by if you’re curious about my answers, and then stay a while and get to know Rebecca if you haven’t met her yet. I´m glad you can say that this book dispelled some intimidations of Russian works, because I often feel intimidated by them and have read few Russian works. Perhaps this is the one to start with!? Welcome back! I'm glad you were able to save your files - that's always my hugest worry. I am just working on a book at work about Modernism, and there was a whole big section on Chekhov's influences. None of it seems to have stuck - he didn't sound awfully outrageous to me, though of course that's just because I have all these years of more outrageous art behind me. Welcome home! You have been truly missed. I am impressed with your venture into Russian literature. Unfortunately those three little words ' classic Russian literature' send me into a cold sweat. I seem to have a fear of them, that they will be far to high brow for me. I am pleased Chekhov worked for you. You know, I've never thought about reading Chekhov before. Just sort of never made my radar screen. Had I considered it, I undoubtedly would have been intimidated. But after your review, I think I can skip that step. :) The few stories you briefly described sound like I would enjoy them very much. I'm guessing that there are some of his stories online...I think I might just have to see what I can find to get a taste. Thanks, Ana, for yet another wonderful review! I've read a few of Chekhov's stories and have enjoyed them for the most part, though I rarely understand them completely. I've found Chekhov is far more readable than most of the Russians I've tried. I always knew you were smarter than I am. Just the thought of reading Chekhov's work intimidates me. I love being reminded of writers that I love! Thanks! I read Dostoevsky for the Circuit, and like you, I am no longer nervous about reading the Russian greats. Dostoevsky turned out to be immensely more accessible than I thought he would be. I have never read any Checkov, but I have always wanted to! It sounds like a beautiful collection and I am so glad that you liked it and found the author kind to his characters. It's always nice when an author writes with such compassion. A wonderful review as usual! There was a TV show not long ago that was all about Russian history. It was like 4 hours, but it wasn't bad. You might be able to catch that online. I agree, I think Chekhov is really accessible. I hope someday to read all his short stories -- there are so many different collections and all of them are good. I'm inspired now to try and read some of the plays also. I've enjoyed the stories of Chekhov's that I've read (alas, none of these so I will have to find them)--so glad that you do, too. Perhaps the empathy and compassion that you noticed (emphatic nod of agreement, here) stemmed from his "day job" as a physician? Good that your computer troubles are over. That is such a hassle! Chekhov was one of the major influences on the brilliant Horton Foote, screenplay writer of To Kill a Mockingbird, a man to whom I owe everything. What they wrote was quiet and eternal. Violet: I've only read one Mansfield story to date - must correct that soon! Jenny: Yes, looking back none of what he does seems shocking at all, but what I thought was interesting is that it read a lot more like contemporary fiction that most of the Victorian stuff I'm used to. Vivienne: Thank you so much! I completely understand your fear, but Chekhov was a very pleasant surprise! JoAnn: Thank you! And thank you for the non-fiction titles - I shall look them up. Kathy: I'm not! Honestly, these were surprisingly straightforward and accessible. Elisabeth: Have you also read his plays? If so, do you think I'd like them? Trisha: I'm happy to hear that! I think Dostoevsky will be my next. Zibilee: I know - it's something that really, really draws me to an author's work. Amy: Thank you :D And I loved that comment also. Heidenkind: Ooh... I should look for that. Stu: Definitely my weakest also (not that I read nearly as much translated literature as you do!). Karen: He was extraordinarily productive, wasn't he? Especially for someone who sadly died so young. Shelley - "Quiet and eternal" is a lovely way to put it! I havent read Chekhov, but your review makes me want to give it a go. 'literature can teach us empathy and compassion; it forces us into the shoes or others and makes us acknowledge the common humanity that binds us to even those whose lives and ideals are completely different from our own' <-perfectly put! I have read only one Chekhov short story and was not impressed by it, but of course it was only one of many. I want to read more of his work. It is strange to think of him as a contemporary to the Victorians. I never really thought of that before. I love reading your reviews. You have a way of expressing yourself that I wish I had. Naida: Thank you! That's one of my favourite things about literature. Rebecca: Aw, thank you so much! And yeah, it's hard to tell with just one story. He was amazingly prolific, so some are probably weaker than others. I hope you'll give him a second chance! My favourite Russian writer when I was younger was Ivan Turgenev. Most of his stories that I read were love stories and he really knew how to capture the hearts of young people. Have you read any of his books? I have read some of Chekhov's plays and they are really wonderful. I would also recommend a Russian movie which is based on one of Chekhov's plays called 'Platonov'. The movie is called 'An Unfinished Piece for Mechanical Piano' directed by Nikita Mikhalkov. It is a wonderful and beautiful movie. If you do get to see it, I would love to hear your thoughts on it. As much as I say I love Russian lit, I've never read Chekhov. I must remedy this soon. Thanks for your beautifully written (as always) review. 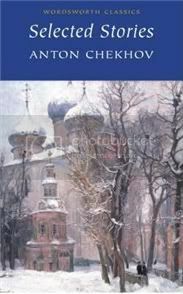 Vishy: I've yet to read any Turgenev, but the introduction to this edition mentioned that he was an influence on Chekhov. Which of course makes me want to read him! Also, that quote also made me think "this guy is cool" ;) Finally, made thanks for the movie recommendation! I'll be sure to look for it. Michelle: Thank you for the kind words! I really enjoyed the Chekhov stories I read two years ago (http://reviews.rebeccareid.com/stories-by-anton-chekhov/) because I did think they were universal. I loved how he captured human nature. I really should revisit him some day soon.